Shell size to 70 mm (but see below). 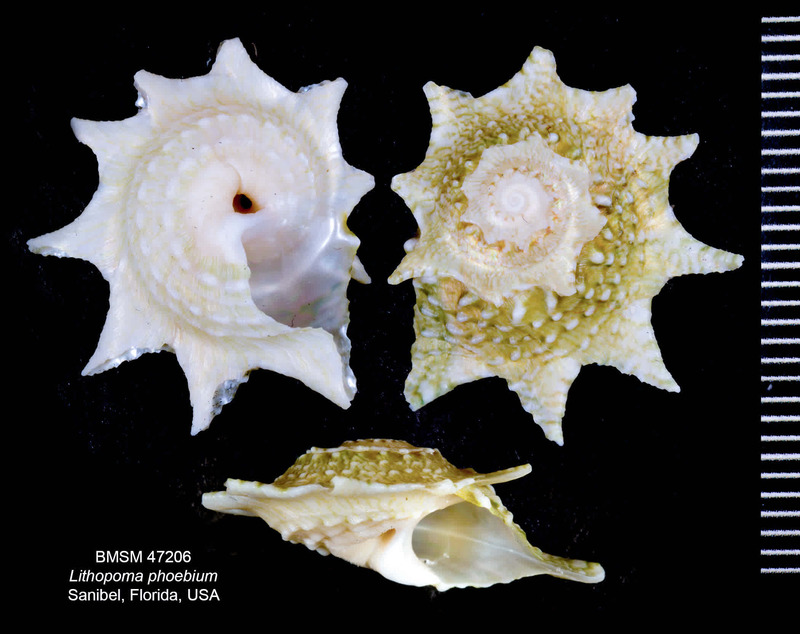 Shell turbinate, usually wider than taller, with about 12-17 triangular spines on the shell periphery; these spines may be worn or reduced in size in some specimens. Base flat, with wavy threads crossed by a few raised spiral cords. The color is variable, with light-brown and greenish hues present, and a whitish base. Although the species is common in other parts of the Gulf of Mexico and Caribbean region, it is not a common species in SW Florida. The shell illustrated, measuring about 22 mm, was found in December 2009 by Jeff Oths on the bay side of the Lighthouse Beach on Sanibel. Another shell of this species, measuring about the same size, but with shorter spines, was found in February 2019 by Parsa Fard, also in the Lighthouse area.